Country Mouse Tales: Surfacing From the Boxes! The move is going great, we are happily sitting on boxes and musing about the walls. What should go where and who should hang what, you know the drill. The only room that is finished is Jack's room. And by finished I mean the furniture is in place. The guest room is getting close, there is a bed in there at least. With clean sheets. Our room? Well, not so much, but we have gotten used to living in a basement for the last four months, so pretty much anywhere with windows is a bit of a luxury at this point, even if the mattress is still on the floor at this point. Speaking of luxury, in a rare fit of indulgence, Matt and I went out and made a pretty big splurge. Since getting married two years ago, we have had hand-me-down beds. Not that it has been a problem, we have always liked our bed, but it is a full sized bed, and when you are six feet two inches tall (Matt...not me!) and your wife is a whirling helicopter of elbows throughout the night, you start to feel a little cramped. Poor guy. We found a good deal and bought ourselves a new bed, new mattress, AND new furniture for the bedroom. We felt that we needed a little retreat, where we could snuggle and be exactly what we are - a young married couple. But here is the problem, I have looked at comforter after quilt after duvet after sheet set, and I CANNOT figure out how to decorate this room!! Our new furniture won't be here until July, which is actually a blessing because if I had to buy our bedding right now I would end up with something I most likely regret in a week. 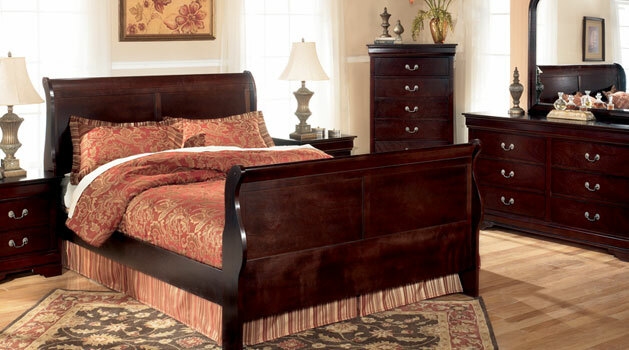 Here is the stock photo of the bed we settled on, Matt has loved sleigh beds for as long as I have known him. Help! Point me in the direction you think would work well here, PLEASE! I can't see the picture, but I can mentally picture a sleigh bed.... and I suggest looking at websites like potterybarn.com and westelm.com. Even if you don't buy the bedding from them, you can get some great color schemes. I love blues and grays. I really like Pottery Barn's yellow duvet covers... Painterly Paisley is what it's called, I think. I can't wait to be able to make our bedroom a retreat!! I LOVE home decorating. If you don't have a strong sense of direction on the bedding, then maybe you could take a neutral approach to the quilt or duvet and then use pattern and color with a throw blanket (for the foot of the bed) and throw pillows. If you tire of the patterns, then it's not a huge investment to change or replace them (versus changing the entire duvet or quilt). Also, Urban Outfitters has SUPER cheap duvets! The bed is lovely! I stick to neutrals in our bedroom. Kinda boring I know. Our bedspread is brown. YEA for moving and new furniture! I think slate blue would look really pretty with that dark wood. Or even a red. There is a lovely blue/green set at Target that would go smashingly with that bed! (And if Jeff hadn't broken ours, it looked just like this!) It's reversible and it's not too dark or too light! They are making the movie, Water for Elephants. I don't know about you but I like to watch someone else's interpretation of a book that I've read. PLEASE, Matt would LOVE Pink with ruffles and lace! I have often said I do not care what color but not PINK! Dan and I are painting our bedroom a grey/blue ish color and I think going for while/yellow bedding to lighten it up...since your room will be white maybe try darker stuff for the bedding?! I love Sleigh-beds too! I went to KY last week and stayed in a wonderful B&B and was lucky to get a room w/a Sleigh. It had solid yellow sheets...a duvet...and solid color chenille spread. It had a solid quilt w/a stitch flower pattern folded over the bottom 3rd. It was lovely...and I didn't take a pic.